Stan (Lee Marshall) is a successful businessman. He has a beautiful wife. A fast car. A terrific house. He also has a lover. When his wife finds out about his philandering ways, "til' death do us part" gains a whole new meaning as she is driven to rather extreme measures where no one is safe. 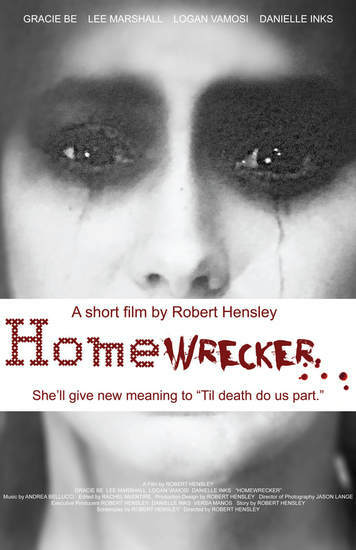 Written and directed by Robert Hensley, Homewrecker is described by the filmmaker as a "short, gothic ghost story" inspired by aspects of the traditional Mexican or Southwest US fable. The film possesses a passion and intensity, the passion first derived by honest, raw scenes of Stan's affair with Dean (Logan Vamosi) then followed up by the fury with which Rona (Gracie Be), Stan's wife, reacts to the painful discovery of her husband's infidelity. Shot over two days in July 2018, Homewrecker carries with it the kind of packed in rage and emotion one might expect when such a scenario unfolds. To his credit, however, Hensley takes Homewrecker places we don't expect and Jason Lange's top notch lensing follows Hensley's every word and emotion. Andrea Bellucci's original score adds to the film's intensity, companioning the ups and downs with vibrance and emotional resonance. While the film's ensemble cast is strong across the board, one simply can't go without giving extra kudos to Gracie Be for her work as Rona, a role that vacillates between vulnerable despondence and unfathomable rage. Be sells it all with conviction and drive and the sort of balls to the walls performance that is absolutely necessary here. Both Vamosi and Marshall are strong as well, their actions seemingly apathetic about anyone but themselves until Rona's rage clicks in and the wheels are in motion for her vengeful pursuits. Homewrecker is currently on the indie fest circuit and should easily appeal to anyone who embraces the low-budget indie horror scene. In this case, the lower budgeted film actually helps the cause by enhancing the film's gritty, raw atmosphere and aura. For more information on the film, visit its official website linked to in the credits.